Materials of regular use in everyday life, such as glasses, ceramics, and metals, are processed or refined as melts at temperatures above 1000 °C. By determining the melt viscosity of these materials with FRS, a consistent high quality of the final product and an optimization of the energy-intensive production process can be ensured. Furthermore, these systems open up new ways in R&D of materials with a high melting point. The Furnace Rheometer Systems each combine a highly accurate air-bearing rheometer head and a lab furnace for viscosity measurements of melts at furnace temperatures up to 1800 °C (1700 °C sample temperature). There are two models available: FRS 1600 reaches sample temperatures from 300 °C up to 1500 °C. For rheological characterization of materials with a melting point above 1500 °C, FRS 1800 is the right system. The CE safety concept ensures full protection of the whole system. After the solid sample has been placed, the combination of pneumatic pre-positioning and the stepper-motor-driven fine positioning ensures a controlled and accurate immersion of the measuring system into the sample. This is done automatically as soon as the sample has been melted. 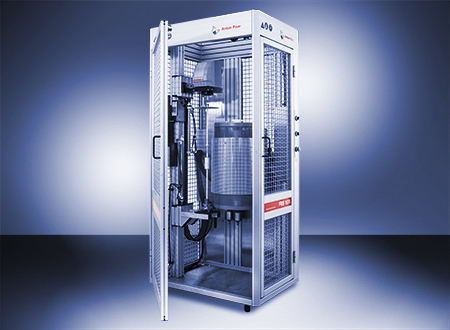 During this process the operator is outside the safety cage, protected from the lab furnace, and works with the proven Anton Paar software RheoCompass™ that supports fully automatic operation during a test and enables simple reporting and evaluation of the results. 25 years of experience in one motor – you only get this with rheometers from Anton Paar. The air-bearing-supported synchronous EC motor deploys a frictionless synchronous movement of the rotor inside which enables the most sensitive and therefore most precise movements at a large shear rate range. In this way even low viscous samples can be measured with an unprecedented precision. The normal force sensor in the rheometer head allows for precise detection of the melting point during the measurement in rotation. In the oscillation mode, the solidification point can be detected. 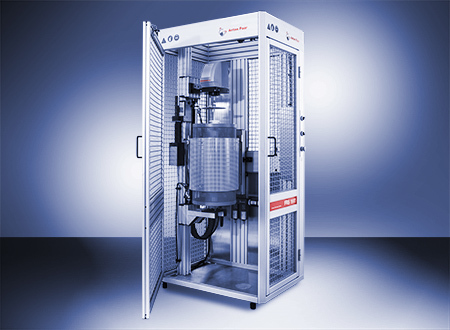 Furthermore, the robust laboratory furnace with its air- and water-cooled system allows best-in-class temperature stability and accuracy of the sample temperature. With the FRS systems, you can either chose to measure under air, or also under inert gas atmosphere. The inert gas atmosphere prevents the sample from unwanted chemical reactions during the measurement, such as oxidiation. 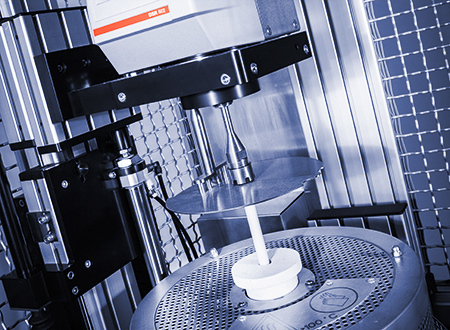 The furnace rheometer systems FRS are compliant with international industry standards: ASTM C1276 (Standard Test Method for Measuring the Viscosity of Mold Powders Above Their Melting Point Using a Rotational Viscometer), ASTM C965 (Standard Practice for Measuring Viscosity of Glass Above the Softening Point), and ISO 7884-2 (Glass Viscosity and viscometric fixed points; part 2: Determination of viscosity by rotation viscometers).